Product information "Shimano SLX Disc Brake-Set BR-M7000 XC front/ Rear black"
The SLX hydraulic disc brakes provide the industry-wide standard for low-cost high-end braking systems. This brake is characterised by reliability, reliability and great performance. The new M7000 was equipped with lighter and more robust master cylinder, which seamlessly integrates with. This, the SLX cockpit gives a sleek, sporty look and even more space on the handlebars. The revised SERVO WAVE brake lever provide a better braking feel and a clear, clear feedback and a short lever way translate into high braking performance. As with previous versions are adjustable in the new SLX brake grip (tool free). Please pay attention to the max. permitted disc diameter depending on your fork! brake lever, brake caliper and brake line 1000 / 1400mm, brake pads, filled and bled. 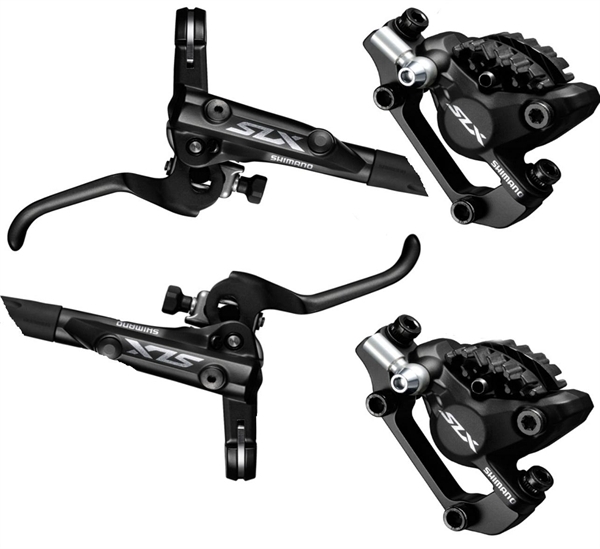 Related links to "Shimano SLX Disc Brake-Set BR-M7000 XC front/ Rear black"
Customer evaluation for "Shimano SLX Disc Brake-Set BR-M7000 XC front/ Rear black"